Remodeled duplex in downtown Crested Butte with a fenced in yard! Welcome to Powder Paradise in Crested Butte! 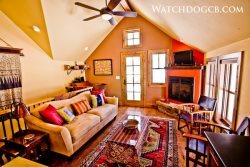 This is a great townhouse that lives like a stand-alone home and is one of the most coveted locations in the west-end of downtown historic Crested Butte. Powder Paradise is lovingly named after the owner's favorite pooch, Powder! Powder paradise was recently remodeled by a local designer which offers a great use of the space and high-end finishes. You enter on the ground level, where you can sit and take off your shoes. There is plenty of storage in the entry to store your bike shoes or snow boots, mittens, and plenty of other items. There are two bedrooms located on the first level. The first master bedroom has a King bed, double glass doors that lead to the outside for some fresh air and a private television. There is also a dresser and large closet to be able to set up as if you were at home! The second bedroom is also located on this first level and has a Queen bed. There is a full bath, plus the in-home stereo system, where you can plug in your iPod or iPhone. The second level has the main living space with a small deck that has a propane gas grill (it's an oldie but a goodie!) The living area has a dining table that sits 6, two comfy couches, and also a separate Satellite TV. The living room has a queen pullout couch for those that prefer separate sleeping. The kitchen has most things that you will need to cook up a quick snack or a full dinner for the group. There is gas cooking, full-size fridge, and a dishwasher. This property also offers both a French Press or a standard Drip Coffee Maker for you Coffee Lovers. There is also another full bath on this level and a Washer and Dryer. Outside there is one dedicated parking spot (additional parking around the corner) and there is a fully fenced-in yard. In the summer there are beautiful local flowers to enjoy while sitting in the Adirondack-style chairs and enjoying the great Colorado sun. This property comes with one parking space. If you do not have a large truck or SUV there is potential to fit two vehicles in the space, but this is not guaranteed. This property will only be available for winter reservations.